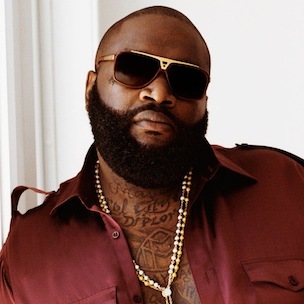 Rick Ross is an American rapper, entrepreneur and record executive, best known for his hit rap albums. His debut album, Port of Miami, was released in 2006, which yielded the singles, “Hustlin'” and “Push It”. The album reached #1 on Billboard Hot 200 and was certified as “Platinum.” He has collaborated with Lil Wayne, French Montana, Gucci Mane, and Jay-Z. He has also collaborated with popular DJs such as DJ Smallz, DJ Kroink, DJ 2Nen and DJ Ideal on mixtapes. Born William Leonard Roberts II on January 28, 1976 in Clarksdale, Mississippi, he was raised in Carol City, Florida. He has an older sister named Tawanda. Following his high school graduation, he attended the historically black college Albany State University on a football scholarship. He is the parent of two children: Toie and William III. He became engaged to Liz Hagelthorn in May 2017. *He was born on January 28, 1976 in Clarksdale, Mississippi. *His real name is William Leonard Roberts II. *He is the founder of Maybach Music Group. *Ice Cube, The Notorious B.I.G. Trick Daddy and JT Money are his musical inspirations. *He once worked as a correctional officer (December 1995-June 1997). *He is friends with Lil’ Wayne, and Ludacris.